Student pharmacists Markesha Cook and Caleb Darensbourg recently represented Belmont at a Graduate School Fiar hosted by the Tennessee Louis Stokes Alliance for Minority Participation (TLSAMP). 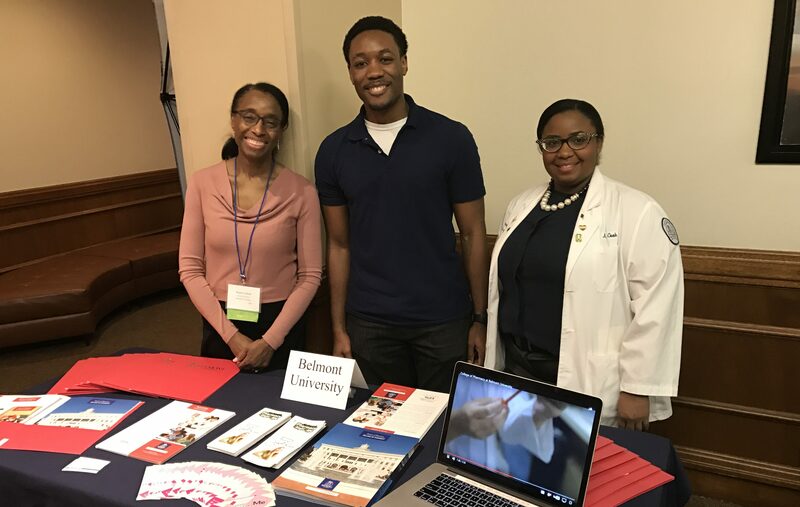 Held on Feb. 23, the Fair was conducted in conjunction with the TLSAMP Annual STEM Undergraduate Research Conference. Drs. Edgar Diaz-Cruz and Marilyn Odom represented the College of Pharmacy faculty. The Alliance is composed of 10 institutions in Tennessee — Fisk University, LeMoyne-Owen College, Middle Tennessee State University, Nashville State Community College, Southwest Tennessee Community College, Tennessee State University, Tennessee Technological University, University of Memphis, University of Tennessee-Knoxville and Vanderbilt University.